You want to scream. You want to yell with laughter. You want to cry out in fear. You want to hold your arms high in the air and shout, "I'm king of the world!" But that would be a bad idea because you're still flying along at 80km/h in what's probably a 60km/h zone, trying not to be swamped by Sicilian traffic, trying to blend into the madness of the island, trying to stay afloat in a sea of commuters who seem desperate to get to wherever it is they're going as fast as possible so they can get back to doing as little as possible. Welcome to Sicily. Welcome to riding a scooter on Sicilian roads. Welcome to Sicilian traffic. It's frightening and exhilarating, electrifying and petrifying. There are cars and scooters everywhere, and not one driver is paying the slightest bit of attention to the road rules. If there are any. I'm in Catania, the island's second-largest city, and a place you don't want to hang around for too long on two wheels. While the rest of this journey will be spent on open roads, enjoying gentle cruises through olive groves, winding rides up mountaintops and cool glides down the coast, the Catania section is madness. I'm trying to navigate my way through as smoothly as possible so I can get back to the sweet succour of the countryside. Sicily on a scooter: is there any better way to see the place? It's long been a dream of mine to explore this untamed part of Italy on the back of a trusty motorised steed. 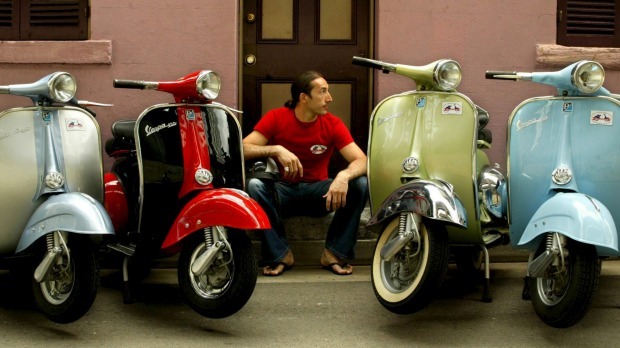 Ever since buying a Vespa in Australia about eight years ago I've planned to go back to the famous scooter's roots, to tackle its homeland in the most authentic way. And so here I am in Sicily, enjoying the hot breeze in my face, taking in the sight of Mt Etna smoking away to my right, and the rich blue of the Mediterranean laid out sparkling to my left. In front of me: the open road. This isn't an easy trip to undertake. In fact I fell at my first hurdle: attempting to hire a Vespa. You need to plan well ahead if you hope to secure one of those quintessential Italian beasts around here. I made my plans late, and turned up at California Rentals in the town of Taormina to find that the only scooter available was a not-very-romantic Chinese job. It would have to do. 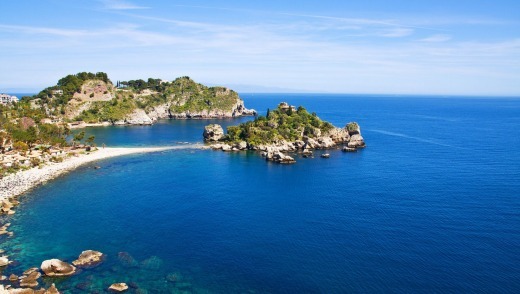 Taormina would be the start and end point of my journey. The mountaintop town is a stunning little spot, and a haven for tourists. My plan was to hit the open road and try to discover a few parts of Sicily that aren't quite so busy. So I strapped on my helmet, gunned the engine, took a deep breath and prepared to enter the world of Sicilian traffic. First lesson: stay on the right-hand side of the road. Second lesson: expect the unexpected. I was pootling down the tight, winding road that leads to the coast below Taormina, about two minutes into my adventure, when a guy in a Fiat Uno screamed past me on a blind hairpin bend. OK. I would be overtaken a lot on this trip. 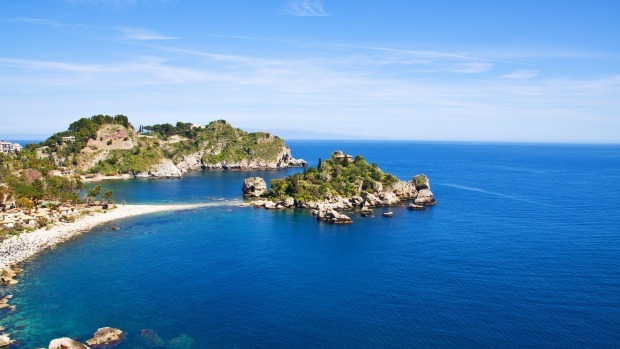 My first port of call was only a short ride away: Isola Bella, the seaside resort town below Taormina. It's a rugged, almost impossibly beautiful spot where I took a ritual dip in the Mediterranean to mark the beginning of my journey. Then I called into a cafe in nearby Giardini Naxos for a granita – an icy Sicilian treat that's somewhere between gelato and milkshake – before I pointed my way south and hit the road proper. And that road was busy. Busy with summer holidaymakers, busy with cars and pedestrians and other scooter riders choking the streets. There's an autostrada, a six-lane motorway, nearby, but there was no way I was going near it. This journey was about seeing things – not risking my life at 100km/h. So I wound through quaint village after quaint village, over bitumen and cobbled roads, enjoying the sights, the smells, and the feeling of sun on my arms. I stopped for lunch in Acireale, a sleepy coastal town where I found a beachside trattoria to enjoy spaghetti alla vongole while watching locals play in the ocean. And then I headed towards Catania. There are a few ways to mark yourself out as a tourist when riding on Sicilian roads. One: indicate. No one else seems to bother. Two: stick to the speed limit. Three: don't weave maniacally through moving traffic. That's a local custom as deeply ingrained as the siesta. And I'm in Catania. I've taken a wrong turn somewhere. I should have followed the SS114 road all the way through town, but now I'm in somewhere that looks very unfamiliar and there are cars racing past in every direction. I've got a decision to make: keep roaring around in the hopes of stumbling back upon the SS114, or pull over and check my phone's GPS. I opt for the latter, and pretty soon I'm back where I should be, headed south once again. I'm aiming today for Siracusa, which is still a few hours' ride south. The roads now are open and quiet, so I can gun the scooter up to 80km/h as I cruise past the lidos and beach resorts that dot this section of the Sicilian coast. The sun beats down on my face, the olive groves whizz past, Mt Etna fades in my mirrors. And then I get pulled over by the police. It's a dusty, lonely stretch of road where a couple of uniformed Carabinieri flag me down and motion for me to get off my bike. I fix an innocent look on my face and play my trump card: "Parla Inglese?" The policeman nods. "Of course. License and papers please." Hmm. I produce the registration papers and my Australian drivers licence. The policeman keeps his hand out. "And your international licence." "I don't have one," I explain. "I don't need one here." The two policemen pore over a book for a few minutes before eventually turning back and handing me my licence. "No, you don't. You can go." Phew. And so on I ride, finally making it to the outskirts of the charming old town of Siracusa and navigating my way to my hostel. It's been a long day in the saddle – six hours and about 150 kilometres – and I'm ready for a beer and a good lie down. The next day I'm back on the road south, first calling past the resort town of Fontane Bianchi, a favourite among Italian tourists, a long beach strewn with umbrellas and deck chairs. I take another dip in the sea before getting back on the bike and entering the Sicily of my dreams: winding country roads hemmed in by stone walls; olive groves; arid, rolling farmland; crumbling old houses. I swing the scooter into a detour through another seaside town, San Lorenzo, before ending up in Marzamemi, an old Arab fishing village that today is baking under the midday sun. There are few tourists in the town square as I find shelter in a trattoria, feasting on penne with smoked swordfish as the Mediterranean shimmers in the distance. 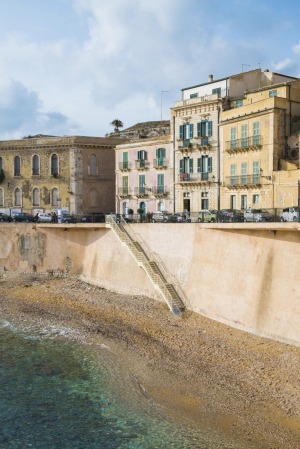 The ride back to Siracusa takes me via Noto, a heritage-listed mountain town rich with baroque architecture. This is the kind of place that would ordinarily take serious planning to visit – on the scooter, however, it's an easy turn off the highway. I eat gelato at a small shop, and wander the quiet cobbled streets. The riding is becoming easier now. Actually, it's fun. I almost feel like a local, overtaking where I really shouldn't, getting a little lax in the use of my indicators. On the ride back to Siracusa I only get lost once, only almost get wiped out once, and only get hit in the mouth by a large insect once. On the whole, pretty successful. On day three I make my way back north, spending the night in the more local town of Giardini Naxos. The ride is easy: I sail through Catania without getting lost; stop for numerous espressos in little cafes; eat more granita than I should. And by day four I've reached the undoubted highlight of this whole trip, a day when I can combine my mastery of Sicilian traffic with the most spectacular road journey I've ever been on. From Giardini I follow the coast north, heading past the turn-off to Taormina and on through winding, rugged hills on the road towards Messina. The Mediterranean seems to stretch on forever as I lean into the hairpin bends leading up to Forza D'Agro, the town in which The Godfather was filmed, a crumbling, gorgeous little place set high up in the hills. Later, I wiggle my toes in the hot sand at another beachside town, Letojanni. It's the picture of an Italian summer down here, with kids playing in the water, teenagers strutting around in their swimwear, parents lugging blow-up lilos and towels, old men arguing on the boardwalk above. Soon it will be time to part with my new best friend, my scooter. I'll have to drop it back at the shop in Taormina tonight. I'll have to spend this final evening solo, eating more pasta at a sidewalk trattoria, drinking more wine, taking everything in. There's just one last ride to go, one last gasp of freedom, one last thrill of the open road. I plan to enjoy it. I'm king of the world. This is not just to phone a friend in case you get in trouble. What you really need is access to Google Maps – without it, you're likely to spend a lot of your time in Sicily getting lost. A local SIM should cost about 20 euros. Sicily is not the place to experiment for the first time with scooter riding. You need to be watching everything around you like a hawk – not trying to figure out where the indicator is. Before taking on a trip like this, get some experience. You'll be supplied with a helmet when you hire a scooter, but the quality of these headpieces ranges from "fairly average" to "you'd be better off with a construction worker's hard hat". Bring your own if you want to be safe. Same with protective clothing. You need to concentrate on Sicilian roads, which means you also need plenty of breaks. 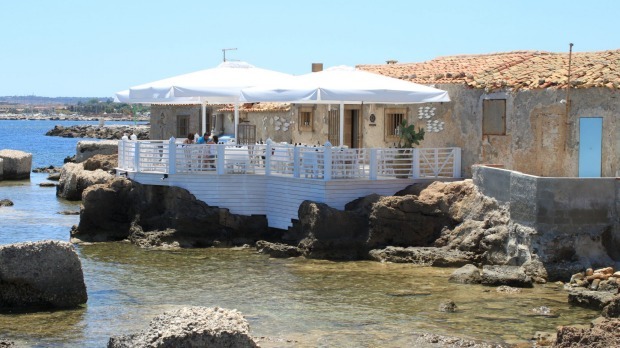 That's fine: this is an island chock full of purveyors of coffee, sellers of granita, makers of pasta and suppliers of gelati. Or you could just jump into the Med. Would it be an insanely bad decision for that truck to overtake you on this blind corner? Then it probably will. Does the fact that that car isn't indicating mean it's not going to pull out in front of you at 80km/h? Not in the slightest. 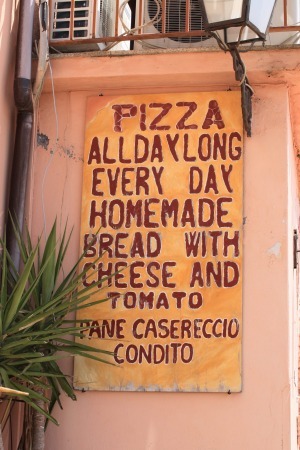 Pay attention in Sicily, and take it slow. Emirates flies daily from Sydney and Melbourne to Rome, via Dubai. Onward connections are then available to Catania or Palermo. Go to emirates.com/au or call 1300 303 777. In Taormina, the Hotel Villa Belvedere has beautiful rooms from $150 per night. Go to villabelvedere.it. 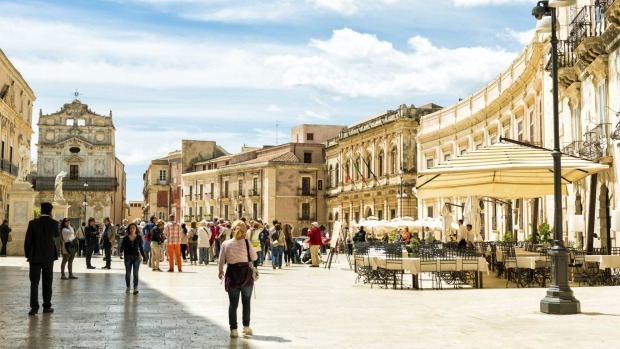 In Siracusa, the Algila' Ortigia Charme hotel has a great location, with rooms from $115 per night. Go to algila.it. California Rentals in Taormina offers four days hire of a 150cc scooter for 137 euros. Go to californiarentcar.com.